In this episode of Valley’s Gold, host Ryan Jacobsen explores the softer side of farming – cotton. His first stop is in Five Points for cotton harvest safety training with Paul Williams, Senior Loss Consultant for the State Compensation Insurance Fund. Each year, prior to the beginning of harvest, workers learn how to protect themselves from a variety of potential injuries due to chemical application, mechanical equipment and even heat exhaustion and sun stroke. Ryan discusses the importance of trainings such as this one with Paul Betancourt, owner of VF Farms and his employee, Ruben Elenes. Dr. Jeff Mitchell, Cropping Systems Specialist at the University of California Cooperative Extension, gives Ryan an in-depth briefing on how UCCE is helping to refine growing practices and develop the most efficient crop varieties possible. 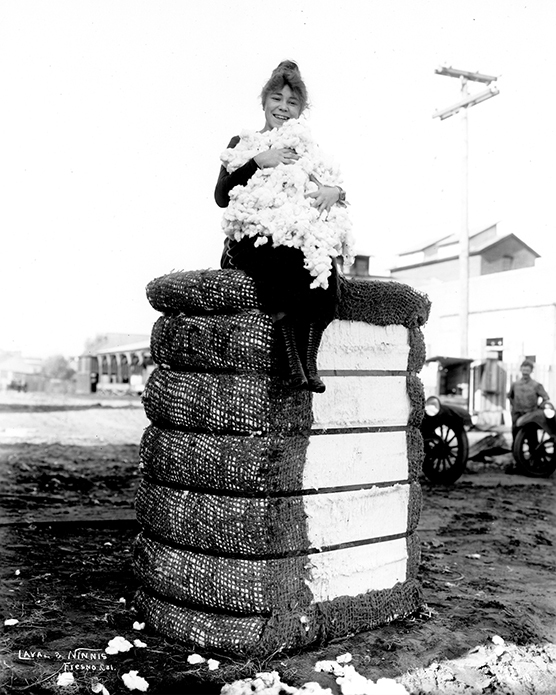 Miss Dora atop Fresno County’s first bale of cotton. Then, Ryan travels back a century through the images of Pop Laval to see how the cotton industry evolved across the Valley. Diversified grower, Don Cameron of Terra Nova Ranch in Helm joins Ryan for a stop in some very special Pima cotton fields and offers a bird’s eye view of what happens during harvest of this valuable local crop. Ryan meets Kirk Gilkey, owner of Cross Creek Ginning, in Corcoran to witness state-of-the-art processing of harvested cotton and learns how each part of the plant is utilized to leave minimal waste. From the seeds to the bales, cotton is a large part of our Valley’s Gold. The Fresno Weekly Expositor newspaper prophesied in a series of articles in 1872 that cotton could be successfully grown in Fresno County. 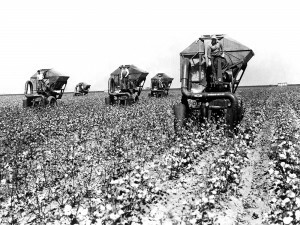 The high cost of labor and transportation, plus the low price for cotton, however, discouraged intensive cultivation through the last decades of the 1800s. James Kincaid is noted as first cultivating the crop in 1867 with his 100 acres near the Kings River. 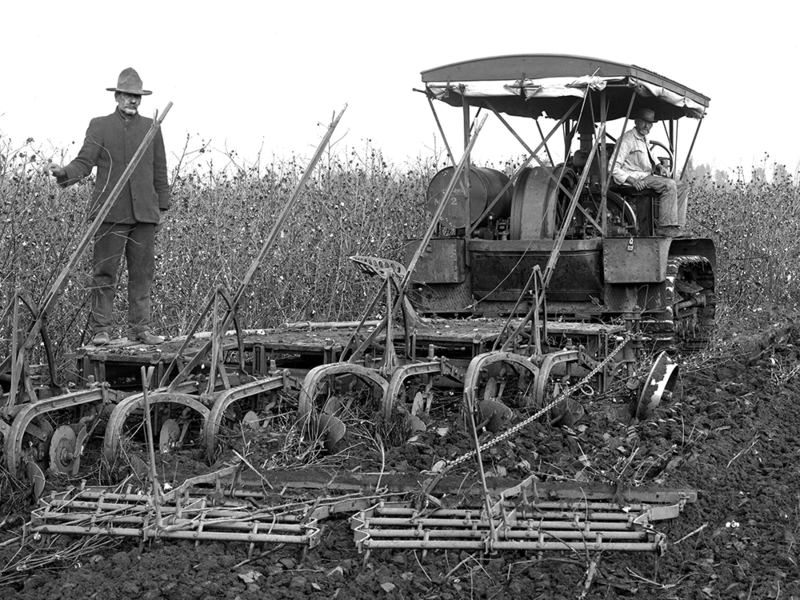 Tractor plowing and harrowing under cotton plants at Kearney Estate on February 24, 1919. 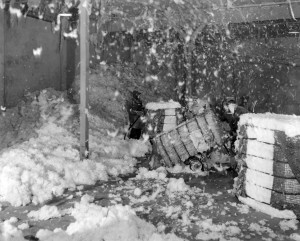 In 1918, the first cotton was ginned in Fresno County at the new California Products Company, a $250,000 gin and drying mill. 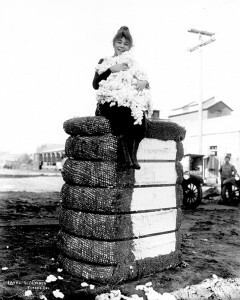 The consistency of high quality cotton yields was assured in 1917 when the U.S. Department of Agriculture introduced the Mexican Alcala strain from Oklahoma and eight years later, the California Legislature limited cotton planting to Alcala No. 5. Continued experimentation improved the Alcala strain until it was perfectly suited to the central San Joaquin Valley’s soil and climate. By the mid-1980s, cotton was the County’s top row crop. 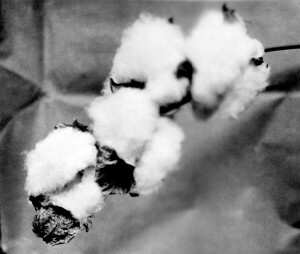 Although spindle-type cotton pickers were ready for production by 1942, the lack of steel due to World War II postponed commercial release of the machine until the end of the decade. In 1943, the International Harvester Company manufactured the first successful mounted cotton picker and “Old Red” was utilized in Fresno County that year. 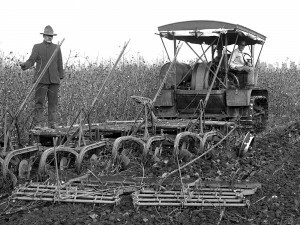 In 1970, Producers Cotton Oil Company of Fresno restored and donated the first mechanical cotton picker in the United States to the Smithsonian Institute. “Old Red” worked for twenty-seven years in Fresno County cotton fields as the forerunner that revolutionized the industry. Once considered a waste product, cotton seed has contributed significantly to the vitality of the cotton industry in the Valley – in particular, the success of Producers Cotton Oil Company. With every 100 pounds of fiber, the cotton plant yields almost 170 pounds if seed. Innovation, experimentation and new manufacturing technologies have developed a variety of products from the seeds. Cotton oil is a supplement for human nutrition and is used in soaps, pharmaceuticals and cosmetics. The seed’s meat is high in protein and the hull is fed to livestock.